I have been longing to go back for a vacation in Alaska, but it took me 12 years to re-visit the place. This largest state of the union, though still sparsely populated, has been made home by different nationalities. 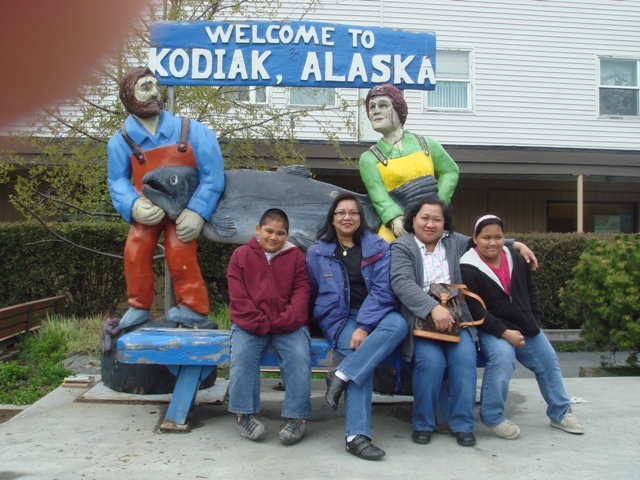 Native Alaskans now mingle with immigrants from different parts of the globe, including Filipinos. If there might be igloos there, I haven’t seen any, the last time I was there. 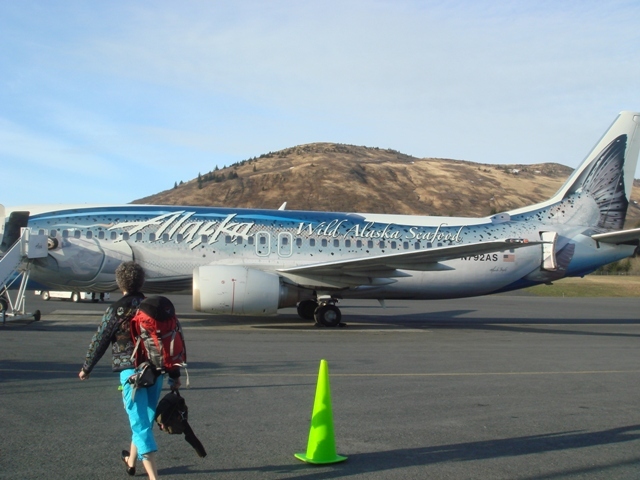 My trip to Kodiak, Alaska started from San Francisco International airport on May 21, 2009. Alaska Airlines, the flag carrier of the State, took off at 7:00 A.M. I have to travel from mainland USA, to arrive in Kodiak Island, at approximately 4:00 P.M.
First stop-over: Seattle, Washington. Huge airport… I can’t find my way to Gate C-17. I kept on going around, and around the terminal, looking for the passageway to Gate C-17. I got lost! My poor sense of direction was again playing a major role in my predicament. Finally, I was able to get help from the airport information desk, and was directed to the place where I have to ride the tram – an underground transit to take me to another building, where Gate C-17 is. It’s good that I scheduled my next flight at least 2 hours apart. After I checked in, and while waiting for my departure time, I settled in a cafe, took my favorite Starbucks grande soy white mocha and choco marble cake. I haven’t had any decent breakfast since I left San Francisco, Ca. Alaska Airlines flight 91 from Seattle to Anchorage departed on time, at 11:00 A.M. It was a wholesome travel, with but occasional slight turbulence, while we were making our descent to Anchorage Airport. The flight attendant informed us that we were flying over Wasilla, Alaska (as if we can have a close view of the town), the hometown of the Governor, Sarah Palin, and who was also the Republican Party Vice Presidential candidate during the November 2008 election. Anchorage Airport was not as busy and crowded as Seattle Airport. At the pre-departure lounge, while waiting for my flight to my final destination: Kodiak, I can’t help but overhear conversations around me. 2 Filipinas were talking, loud enough to be heard by the rest of the passengers: about how they met their second husbands, what kind of life they had with their first husbands, what kind of life they have now. Both of them were going back to Kodiak to visit family and friends. I felt so uncomfortable because other passengers were looking at them, but they seem didn’t care. Finally, it’s boarding time. It will be a 45 minutes flight to Kodiak. The weather was nice, with the sun shining brightly, and with patches of low clouds hovering over the horizon. While on board, I could still see the snow-capped mountains…what a beautiful sight! I now look forward to the 5 days ahead, to enjoy the serene and panoramic Kodiak island. It will be a vacation that I intend to spend and enjoy every minute of it.